PE-400 is specific to test and verify PSE or Ethernet outlet either a standard/active PoE or a NON-standard/passive PoE to avoid damaging Non-PoE device as well as monitor and display available Voltage simultaneously. It built-in PoE interface controller to trigger on 802.3 af, at and bt switch and verify standard PoE type either 802.3 af or 802.3 at, and power source either End or Mid or both, and power polarity as well as display voltage values. The operational voltage which should be measured when installing a new PoE system or when you troubleshooting an existing system. 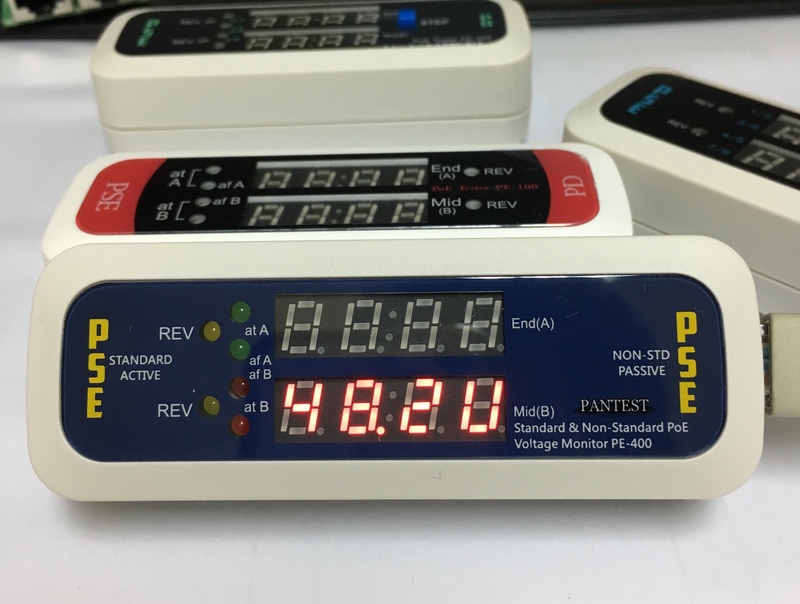 PE-400 verifies whether there is sufficient voltage power to ensure your PD can function correctly and help to avoid damage to equipment when using Non-standard PSE such as some High power injector. 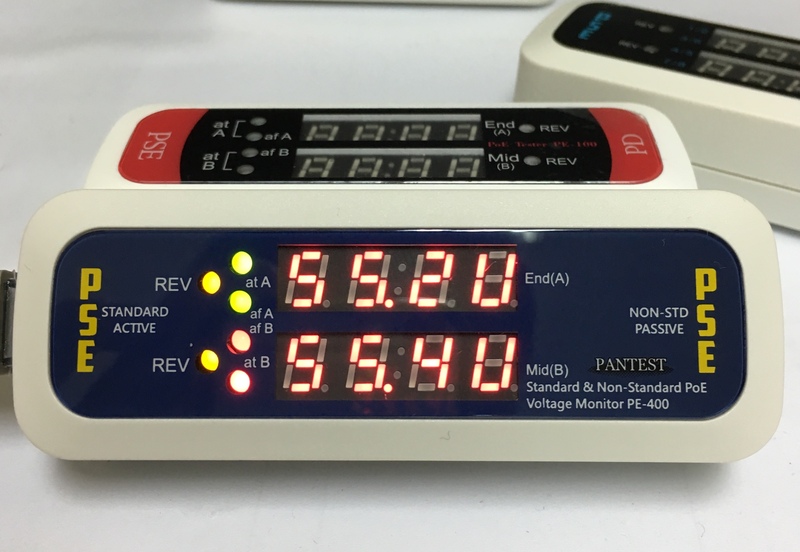 A passive PoE device is not compatible with the 802.3 af/at standard, also due to the difference in voltage rating, problems often occur to damage a passive PoE end device. So need to be aware of what kind of PoE you have and what it will work with. PE-400 can determine whether PSE is a NON-standard PoE and help to avoid and solve problems. It also help to determine the voltage that will be delivered to your remote PDs and verify what kind of PoE you have in your network. PE-400 is an ideal diagnostic tool for all installers working with PoE, IT, wireless and CCTV network system. (End or Mid),power polarity and voltage values at PSE connected. values,power source mode and polarity. A or B mode in 802.3 af or at standard. avoid damaging to non-PoE device. ․4LEDs indicate IEEE802.3 af, 802.3 at standard. ․Dual 7-digit LEDs indicate power source either End (A) (1/2,3/6) or Mid (B) (4/5,7/8) or both and display voltage values. ․2 yellow LEDs indicate reversed polarity for power type. 32°F to 122°F (0°C to 50°C). -40°F to 131°F (-20°C to 55°C). Copyright © 2011 PANSCO, LTD All Rights Reserved.